Keep Your Eyes Open for Upcoming Startups by BITSians! 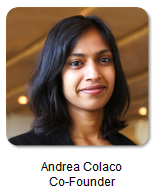 Andrea Colaco graduated in Electrical Engineering from BITS Pilani. She did her PhD from MIT where she teamed up with Ahmed Kirmani who is an IIT Delhi graduate and Prof. Vivek Goyal - the principal investigator at the Research laboratory of Electronics to reveal 3dim. The venture promotes a patented gesture technology for mobile phones that uses just a few milliwatts of additional power from the phone. The idea won the MIT $100K competition. Founded by Sri Hemakiran from BITS Pilani Goa, Nikitha Reddy from BITS Pilani Hyderabad, Khaleel Pasha from NIT Warangal and two others, Scrapehere makes online window shopping experience more fun. It allows you to make a collection of products from any online store and share it with your friends. You also get price drop alerts from Scrapehere. Founded by Kartik Aneja and Kushal Bhagia, Nayi Disha Studios introduces immersive game-based curriculum backed by thorough research and appreciable design. These educational games require kinesthetic participation from children helping them retain concept better and make learning an enjoyable process. Akash Raman, a graduate and a visiting faculty at BITS Pilani, is also one of the co-founders of Oodio. It offers high-quality post production, album design and album printing services to professional photographers that are quick and very affordable. Some of its clients include MakeMyTrip, Aprov and PixMyWall. Founded by Rohit Agarwal and Vineet Markan with a seed funding of $150,000, Framebench is a cloud-based platform that enables creative professionals from remote locations to communicate easily and view images and videos in perfect sync - marking, annotating and changing color composition in real-time - while chatting over the inbuilt voice channel. Last but not the least, redbus.in was founded by BITS Pilani graduates who were working at Bangalore. The venture was started as an online solution to book bus tickets. Now, it is being mentored by Entrepreneurship Acceleration Program (EAP) of The Indus Entrepreneurs (TiE) Bangalore chapter. Follow us at social media platforms and subscribe to our newsletter to receive more such stories.